The beach front property west of the Hotel Ottawa and extending north from the channel for about 1,300 feet was the bathing beach for the hotel and most of the cottage owners. The Chicago and West Michigan Railway owned this desirable chunk of land and it built and maintained this bath house there on the Lake Michigan shore probably until the state purchased the property and developed Holland State Park there. 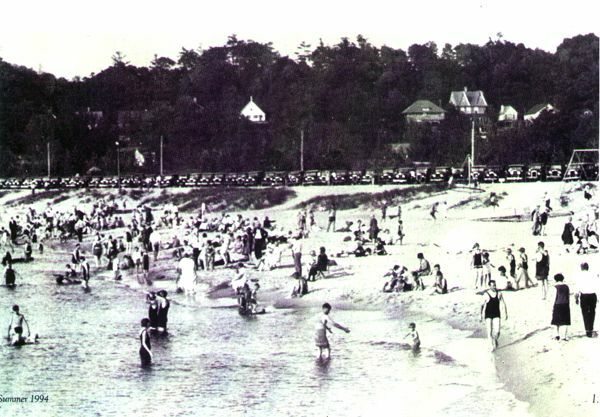 Pere Marquette rail service to Ottawa Beach was discontinued in 1914 and the Ottawa Beach Hotel burned in November of 1923 and was not rebuilt. Fred Pantlind, a cottage owner, was a member of the State Park Board and he urged the State to buy the Lake Michigan beach front property and put a state park there. 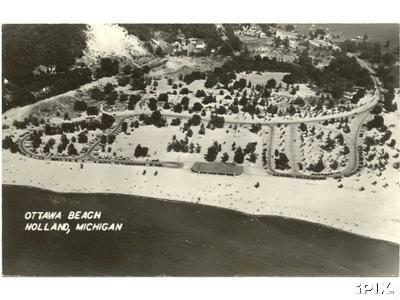 In 1925, the Pere Marquette sold the Lake Michigan beach property, a separate parcel from the property platted as West Michigan Park, to the state of Michigan to become Holland State Park. This photo looks north east from the beach in the new state park and clearly shows several cottages on Terrace Avenue, the upper ????? 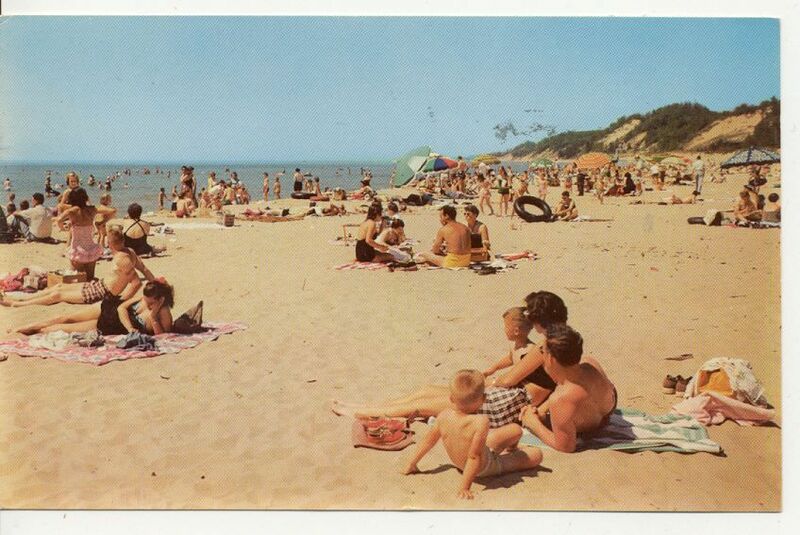 Holland State Park opened in 1928 and has always been one of the State’s most visited and profitable parks. This early view in the park looks to the south. 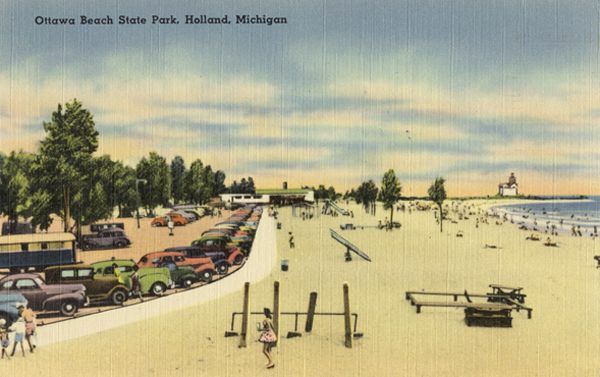 Notice the combination of day parking and trailer camping along the lake front in this photo, possibly in the 1940s. Also note that open water separates the channel from the pier. Several decades would pass before the Army Corps of Engineers would connect the channel with the end of the pier with a concrete walkway. A view looking north dating from 1957. The dune at the far right would become the site of the Spyglass Condominiums decades later. A photo looking east dating from the 1940‘s with the old pavilion in the center foreground and the sandy face of Mt. Pisgah at top left of center.